As far as we are concerned here at Cockapoo HQ, there isn’t much these cute canines can do wrong. They ooze an inimitable charm and are without a doubt, one of the brainier breeds around. While they might not be as intelligent as the border collie, the world’s smartest dog, the cockapoo is a mix between a cocker spaniel and a poodle, the second brightest breed. Combining the best characteristics of the spaniel and poodle, Cockapoos are smart, sociable, energetic and playful, but if left to their own devices, boredom can quickly lead to destructive behaviour. This is a breed that needs to be trained, that wants to be trained. 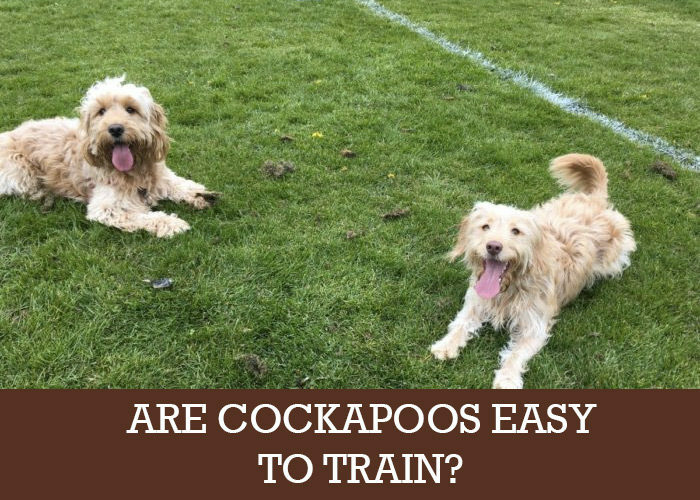 Which brings us to the question: are Cockapoos easy to train? This unique hybrid breed is considered one of the easiest to train. Cocker Spaniels are a hunting breed, who love to learn and are keen to please their humans. Similarly, poodles are intelligent and very eager to learn. While there are some obvious dos and don’ts when you bring your puppy home, it is essential you start with training as soon as possible, through using a qualified trainer, or maybe giving it a go yourself with the help of youtube, or a training book. Even though young pups shouldn’t be going out until they have had their vaccinations, you can start getting yours used to a collar and lead around the house or we prefer to use a harness. It is also important that you spend time touching your fur baby around the feet, ears and tail. This gets them used to being handled in a non-threatening way and will make visits to the vet or parlour a whole lot easier. Cockapoos, like any other breed, should be socialised while they are puppies. These classes let them experience other dogs, people, situations and places and will teach them basic commands like “Sit”, “Heel”, “Down” and “Come”. When your pooch knows and understands the basics, it is easier to manage them at home, at the vet and out on walks. Letting them off the lead for the first time and having them could back should always be one of the biggest things you can reward. It is also a great way to establish an unbreakable bond between you and your furry friend and will stand you in good stead for years to come. But what if you are the proud new ‘pawrent’ of an older Cockapoo or a rescue? With a lot of love, patience and persistence, you will be able to teach your old dog new tricks in no time at all. Pups, like most people, do better with positive reinforcement. This means rewarding them when they respond correctly rather than punishing them for their mistakes. Rewards can include small treats, cuddles and love, praise or anything else your dog especially enjoys. Using positive reinforcement is a great way to keep your ‘poo motivated and enthusiastic, and you will see results quickly. Manners maketh the mutt, and you will need to train your pup not to jump up on visitors, to “sit” and “stay” on command and not to nip or bite, even if he is only playing. And don’t forget, nobody likes a pooch that isn’t potty trained. As a rule, Cockapoos are easy to train, and most owners say that by around six months, their pups are able to follow commands like “heel”, “sit”, stay”, “down” and “come”. They make excellent therapy dogs because of their affectionate nature. And they do exceptionally well on obedience and agility courses. If there were such a thing as a beauty paw-geant in the dog world, the Cockapoo would win hands down. They are the whole package with their striking good looks, their brains, talent, outlook and personalities. The characteristics that make them such popular pets are the same ones that make them so easy to train but if you know of any Cockapoo training problems you are having please let us know in the comments below and we will try and help!